Loneliness, as old as time itself, is not easy to define. It’s a bit like love – you know when you feel it, but cannot specifically define it. However, no one who ever walked on the face of this earth has gone through life without experiencing the pain of being lonely, alienated, and feeling unconnected to others, unloved, or even rejected. Although we, at the 21st century, pride ourselves as inventors [the Internet, computers, reaching the moon, and biomedical advances] we did not invent this one – loneliness was here way before any of us, and consequently we can find it mentioned in the Bible, literature, art, and philosophy. And, as things appear now – it is here to stay. In addition to addressing loneliness, its causes, and how it affects our health, well being, and quality of life, we also discuss what loneliness anxiety is, and the difference between loneliness and depression; For those two may go together, but are actually different. While loneliness is inescapable, it does not mean that when we experience it, or feel it ‘coming’ that we just wait and embrace the pain until ‘it’ decides to leave us. People have developed various ways of coping with loneliness; learning to either avoid it or better cope with it. The book lists variety of successful methods to reduce the pan of loneliness, and some ways to reduce the probability of it happening. You can hardly think of two more unconnected [even contradictory] words than love, the feeling that is so wonderful, and loneliness – the wretched pain that is part of feeling alienated and alone. Research indicates that there may be a variety of instances, and situations, where one partner of an intimate connection feels lonely, despite their love for their partner, or maybe sometimes because of it. We take a look at this puzzling phenomenon and explain it. Various components that relate to the development and promotion of intimate relationships are reviewed. We discuss what to watch for and how to know when the relationship is not doing well, due to loneliness. Loneliness can either be essential, meaning that one of the partners brings it with him or her to the relationship, or the relationship can produce transient, reactive loneliness because it falls short of what one or both partners need and yearn for. 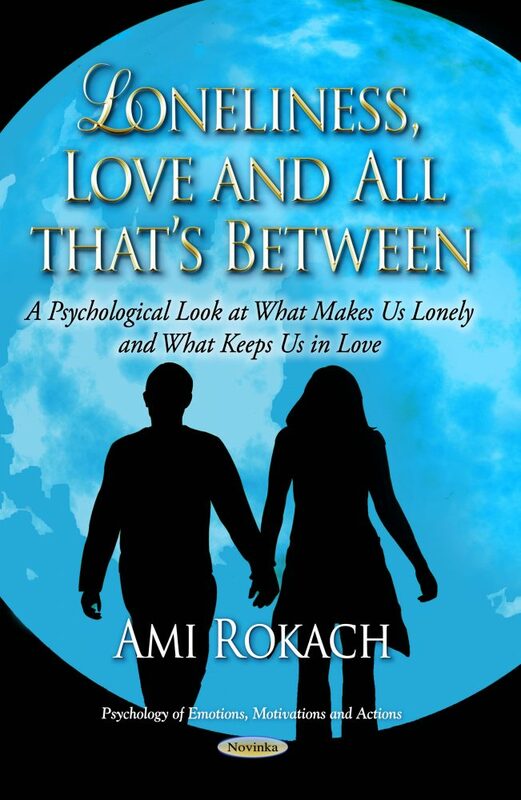 Ending the book is a chapter on what to do when we face difficulties in our relationships. As the title Loneliness and Love implies, we consulted resources that describe marriage enrichment courses, and included many techniques that we could utilize to better our relationship with our spouse, enrich our already good relationship, and if needed, ‘fix’ wounded or broken relationships. An easy and interesting read, written in everyday language, and is geared for anyone who one time or another may experience loneliness and been in love. Chapter 3: Why Are We Lonely?